No doubt numismatic studies have a great passion and excitement for its readers but for the authors and publishers it is a very difficult field. It involves certain special expertise and knowledge of ancient scripts and mythologies. To identify and decipher an ancient coin one should be able to read and make out the legends and motifs of the either faces of the coin and later on interpret them to their respective periods. The European Archaeologists were first to introduce the numismatic study in India. They studied the ancient Roman and Greek coins found in various Indian states. The initial Kashmir coinages were also deciphered by these experts. 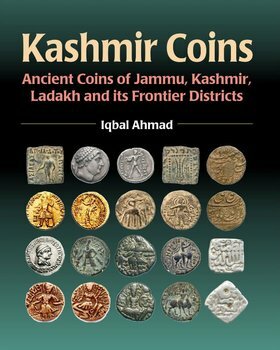 The first article on the ancient coins of Kashmir was authored by a British expert called Alexander Cunningham, which was published in 1843 AD. C J Rodgers British numismatist published his research paper on the copper coins of the Sultanate period in 1885. G.B.Bleazby another coin expert worked as the first Accountant General of Jammu and Kashmir during the period of Maharaja Pratap Singh. He in 1900 prepared the first list of about 1500 coins preserved in the S.P.S.Museum at Lal mandi Srinager, Subsequently in 1923 Ram Chandra Kak in his Handbook of the Shri Pratap Museum gave brief account of the numismatic section of this Museum.